Dating Introvert Men, How to Deal With? 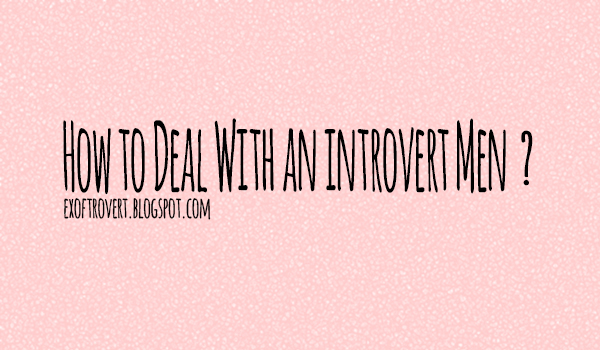 - Ex of Introvert Dating Introvert Men, How to Deal With? Dating Introvert Men, How to Deal With? Dating Introvert Men, How to Deal With? - As a woman, you always want to be loved and understood by your partner. And usually, women tend to demand a lot from her spouse. But, what if your spouse is an introvert one? You may not demand a lot from them. Matters pertaining about an introverted man I've posted previously in When Introvert-Man Fall In Love. Introverted men would love their partner in a different way from most men. And of course, in a good way. Some of the an introvert men would not say directly what they desire about. It sometimes makes women so difficult to understand what is desired by the introverted partner. Therefore, for you who have a spouse introverted man, had to listen to some of the following. Absolutely, Girls. A man will be more impressed with the introverted body language rather than a series of words. You have to use body language to express feelings of love for her. You can smile when asking a favor from him, or simply make eye contact when asked to do things a bit difficult. 2. Acting in accordance with nature. Of course, loving an introvert men sometimes can be very easy, but sometimes it can be very difficult to do. You just need to adjust to him, understand what he likes and dislikes. Sometimes, there are things they do not like to talk in front of people. Not easy to make an introverted man says that he loves you like I-Love-You-things or other romantic phrases. So it is very important for you to give him support and create a pleasant atmosphere so that he would tell his heart's content. An introvert men was difficult to find the right person for his personality. If he loves you, that is to say, he had found the person he considered trustworthy. For all things that have anything to do with him. So, if your introvert men telling a secret things, still keep a secret that only you and he knew it. Introverted guy certainly stout rather spend time with you, alone. Not with your parents, not with your family, or your friends. He can only enjoyed, when he is with you--alone. If you are expecting a strong relationship, then, spend a lot and more time with him. To do whatever you and he likes. To chitchating. Or just watching DVDs at home. 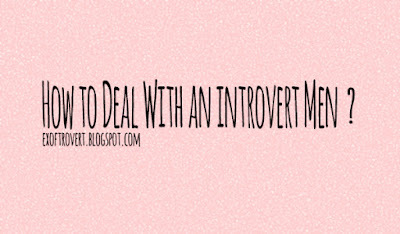 Home » Introvert » Opinion » Relationship » » Dating Introvert Men, How to Deal With?